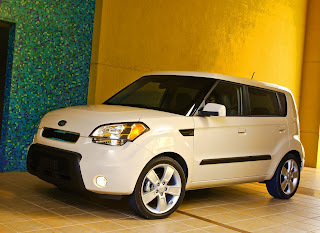 When I attended the WAJ Media Days I was taken with the Kia Soul I drove. It was a bit funky, a bit quirky, and a lot of fun. Now that I have a Soul for some real world use, my opinion hasn't changed. The Soul I'm driving now is not quite as quirky as the one I drove earlier; that Soul had a wild, bright, two-tone (red and black) interior. This Soul, an Exclaim model, is more subdued inside (it does still have the pulsating lights in the front door speakers). The Soul is a FWD, 4-door box; easy to get in and out of and with a goodly amount of storage space, especially if the rear seats are folded down. The base engine in the Soul is a 1.6-liter four cylinder. The test car had the larger 2.0-liter four, which is the way I would go. Fuel economy is very slightly better with the small engine but I doubt that real world figures would vary that much. I'm still smitten with the Soul - it's a cool vehicle that doesn't cost too much. Base price is $13,300 - the Soul Exclaim is $17,900. There are three of these "boxes" out there - the Kia Soul, Nissan Cube, and Scion xB. They really are little station wagons. They all have their own personality, I like the Soul right now but you know me, I'm fickle.